The Specialized Amira is one of the most popular women’s bikes in the road bunch. Curiously, it has a very small internet presence. Reviews are scarce, limited to earlier production runs and tend focus on models at the lower end of the price scale. I suspect this is more to do with freelance budgets and the number of female product reviewers working for cycling websites than reader interest in the bike itself. I test rode an S-Works model Amira in August last year. I was on the Gold Coast to cover the 2015 Specialized women’s mountain bike range for Flow Mountain Bike. Impressed with the fit, feel, and being able to ride comfortably in the drops for the first time in my life, I ordered one immediately. You won’t find many photos of the S-Works Amira circulating the internet wearing XTR trail pedals. There are a increasing number of brands doing great things in the high-performance road bike space and trialling a few before purchasing this one would certainly provide more nuanced ideas about what works, and doesn’t. But armed with a short test ride, some product knowledge and firm ideas about what I look for in a road bike, this one ticked all the boxes. I’ve been riding the Amira Pro for eight months now. What follows are some thoughts on this race oriented design and build. 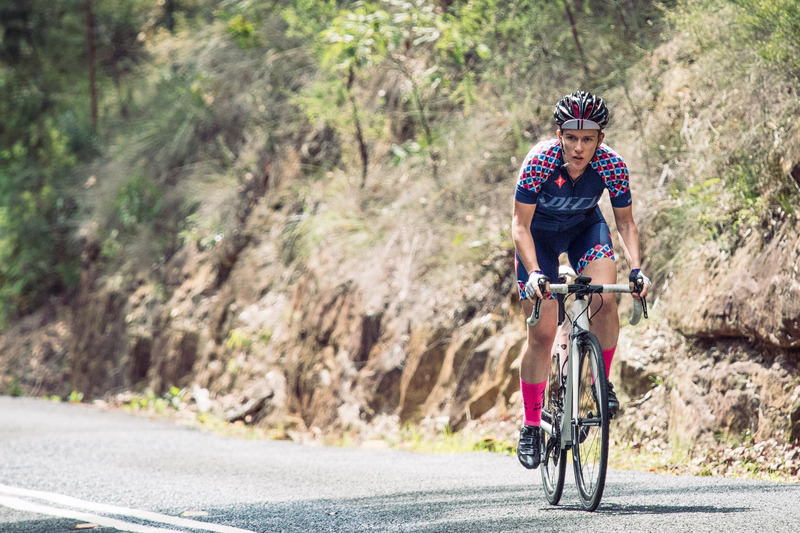 It’s aimed at increasing the internet presence for women’s road bike reviews more broadly, and providing some insights for ladies particularly curious about this one. The first question most people ask about the Amira is what makes it a women’s bike, rather than a bike for anyone. For an in-depth look at the research and innovation behind bikes designed for women, follow this link to a feature article I recently wrote for Bike Radar. The Amira Pro Race is so much more than the sum of its parts. The key differences between the Amira Pro and its male sidekick, the Tarmac, come down to frame geometry, carbon lay up, and size-specific componentry. The Tarmacs offer more variety in terms of spec including models running disc brakes, electronic shifting and both together. The Amiras come in a more nuanced size range at the shorter end of the line up: 44, 48, 51, 54, 56. The Amira has a slightly lower standover than the Tarmac and the frame angles are adjusted to support this without compromising handling. The top tube runs about 1cm shorter too, which means a lot of women won’t have to adjust for this by running a shorter, twitchier stem. The crank length and handlebar width is also a little smaller in the Amira range compared to a similar sized Tarmac. The ride feel is impressively absorbent, but it maintains lightening quick acceleration due to stiffness where it counts. This allows for increased performance, comfort and control, which, in my experience, translates to addiction, frothing and joy. I’ve spoken to a few guys who have ridden both the Tarmac and the Amira and they’ve also commented on the stiffness of the frame under power, while noting that they prefer the softer, more compliant ride feel of the Amira compared to that of the Tarmac (we don’t all ride like Mark Cavendish). 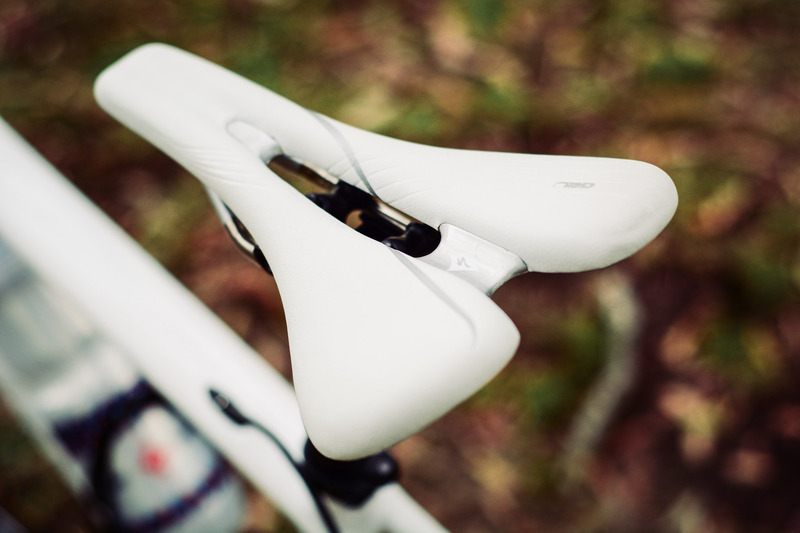 The Oura saddle accomodates an agressive riding position where the pelvis is rotated forwards. Check the #YourRideYourRules hashtag on Instagram to see so many other women loving the cycling lifestyle. Fact carbon cranks, BYO pedals. The Amira Pro runs a mechanical Shimano Ultegra groupset. The Roval Rapide CL 40 carbon wheelset offers stiffness, blingness, speed and accellaration. 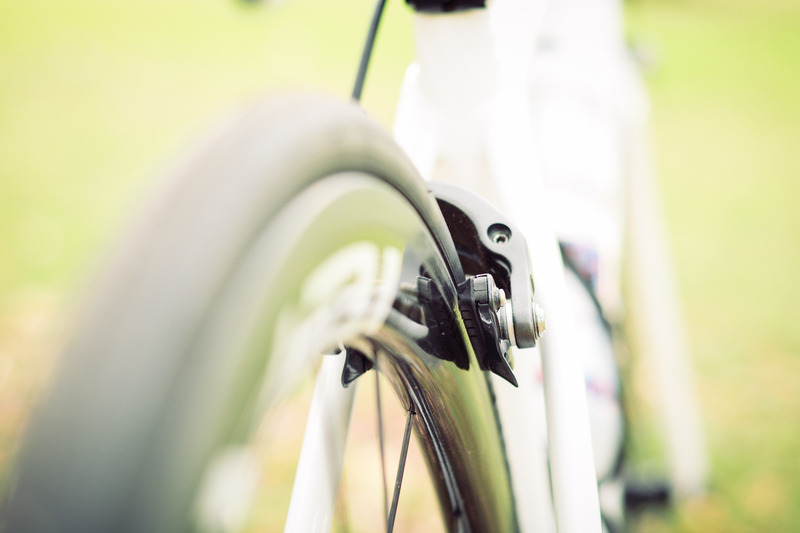 The 51cm and 54cm frames come with 170mm cranks. Smaller frame sizes run 167.5mm cranks. The Pro Race is specced with a Shimano Ultegra mechanical groupset and a Roval CL 40 carbon wheelset. 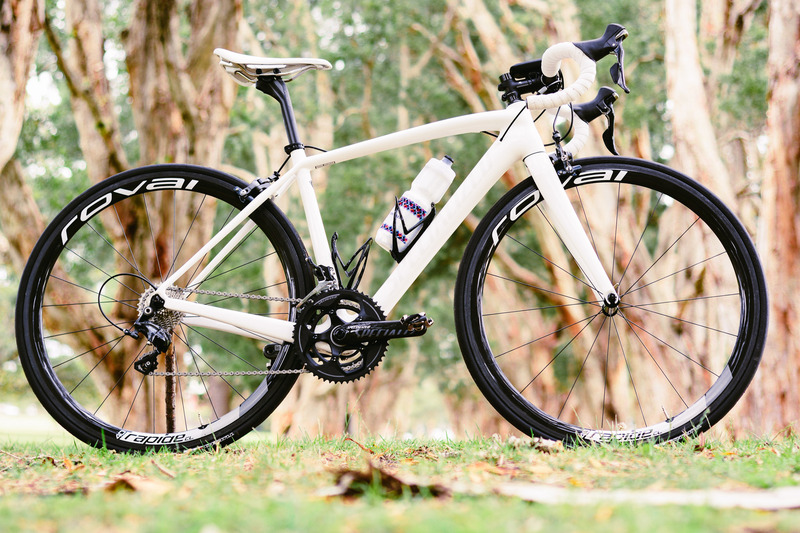 It’s designed for racing and is the bike of choice for the Australian Holden Women’s Cycling team. You’ll see the Boels-Dolman’s world cup team and the Australian Specialized Securitor team on the S-Works version. Personally, I have no interest in racing this bike. In fact, it’s a model above the type of road bike I’ve chosen over the last ten years. I found myself making the upgrade simply because I wanted to enjoy such a nicely specced bike while I have the health, fitness and time to do so. It was nice to be in a financial position where I could afford to dish out some extra cash for carbon wheels, higher quality carbon fibre and shiny, head-turning newness. The cost of the Amira Pro Race will certainly be a limiting factor for riders choosing between this bike, a different model in the range, or a model from a different brand all together. At $AU 6,499 it’s far from cheap. And there are other bikes out there with a comparable spec for a lot less spend. I was happy to pay the extra cash for the lack of post purchase complications and increased pleasure on the road. I’ve experienced a lot of different road bike designs over the last 17 years, and don’t have much patience for designs which compromise handling or fit at the smaller end of the size range. In-store testing has confirmed the 155mm Oura saddle fits the width of my pelvic bones and my body position as I ride. This size comes specced on the Amira Pro but other options are available. I also have no patience for shelling out extra cash as part of a trial and error approach to learning about different stems, bars and seats. There’s enough technology, research and knowledge out there now to enable better informed decisions from the get go. Specialized are a company who have (very explicitly) integrated this into their designs, marketing and in-store support. 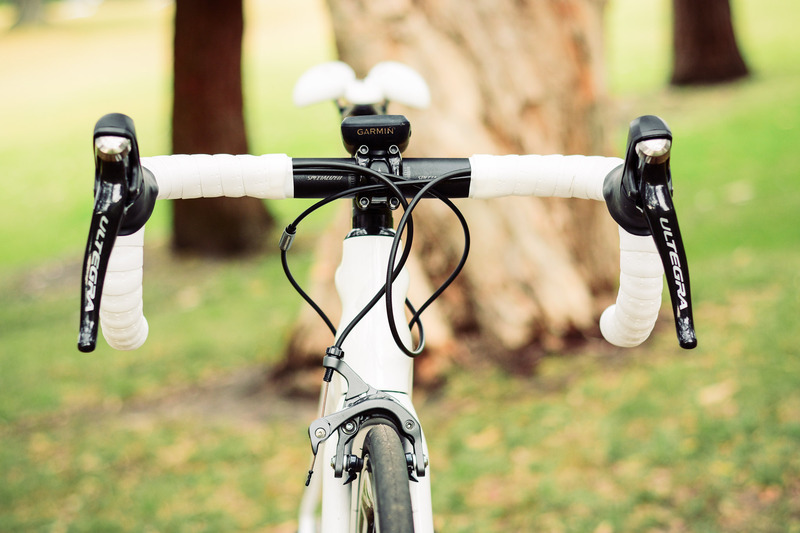 Personally, I crave a road bike design that’s fast, aggressive and provides exceptional handling, something that also resonates with the way I ride and race mountain bikes. On the road, I love the thrills that come from chasing riders much faster than me up and around Sydney’s many urban pinches, twists and turns. I want the bike to be comfortable and energy efficient for half-day epics, or on social rides when my legs are still burning from a festival of hills and lactic acid production the day before. The Amira’s racey handling and compliant build suits these goals to a T.
The first time I explored the limits of this bike on a favourite, pinchy hill climb, the power transfer through the rear end was so much more effective than my previous bike that the rear wheel skipped around underneath me. After evening out my pedal stroke I have since decimated my previous personal best times up said hill – an 800m dash with an average gradient of 7% – able to maintain a comfortable speed and cadence while cresting this climb in the big ring. The Amira Pro runs 52/36 front chain rings. I modified the set up a bit before getting more comfortable in the drops. The Amira is comfortable at a cruise, but the harder you pedal this bike, whether it’s up a hill or on the flats, the smoother it feels; your body position shifts and extra stability kicks in, which takes any last bit of pressure off the bars and seat. If you take one for a test ride, drop a couple of watt bombs and you’ll see what I mean. The Amira is also a pleasure to descend, as you’d expect from a bike of this level. The compliance, control, aggressive geometry and exceptional fit really come to the fore here. While I enjoy the acceleration and stiffness of the carbon wheelset, the downside is reduced braking power. I was initially surprised how much this affected my confidence and enjoyment, especially on long, swooping descents. 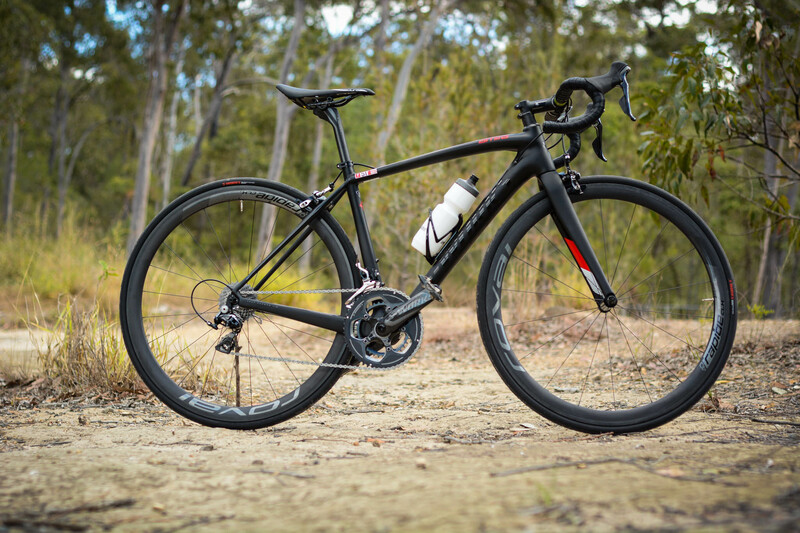 During the first few months on the Pro Race I considered the lack of braking power a near deal breaker and would have recommended choosing the alloy-rimmed Amira SL4 Expert instead ($AU 3,999) or holding out for a disc model. 1000km (and a ride in the rain) later, things improved significantly. After 2000km the breaking is fast, reliably powerful and no longer an issue. To help with this I have also dialled the levers much closer to the bars for increased control, and swapped out the 23c Specialized Turbo Pro tyres for some 25c rubber. The brakes now feel stronger and more reliable in a panic. The irony here is that I can now focus on descending without touching them at all. The current line of Ultegra brakes finally come with a reach adjust screw under the hoods and no longer use shims to bring them closer to the bars, which is great for small hands. The screws are soft and plastic, so best not to adjust them with a rusted screwdriver like I did. The build and component choice of a women’s-specific bike won’t suit everyone, but it’s designed to fit more ladies, with less changes, straight out of the box. Specialized bikes fit my body shape quite well and as such the only change I’ve made to the stock build is the wider tyres. The racey feeling Turbo Pro 23c tyres lasted far longer than I expected. I was glad for the increased puncture protection, but eventually flattened out the rear tyre with a three series TV marathon on the wind trainer during an extended patch of bad weather. I have plans to change the white bar tape to something more attention seeking one day, but the comfort of the Specialized Classic gel tape is holding me back. I’ve mentioned that these bikes fit me well, but I’m going largely on feel, experience and knowledge gained from professional bike fits in the past. Our bodies, and bodily capabilities, change all the time and this has implications for posture, stability, reach, comfort, performance and riding style. In the last two years, transitioning from XC and marathon racing to riding heavier trail bikes with dropper posts has transformed the muscles in my legs. Twelve months learning the trapeze (for a research project on skill acquisition) has increased my flexibility and added much needed strength and stability to my upper body. I also mess with my set up a lot testing bikes and products for a job. If I was to do one upgrade to this bike, it would be to sit down with one of Specialized’s Body Geometry Fit team and learn what small tweaks to my current set up could improve the ride experience further. Upgrades are personal, but I feel this would also be a chance to learn the benefits of some smaller, very specific changes that have the potential to provide a big impact in terms of experience, or take the doubt away from trying to work it out as I ride. In a professional sense, learning more about the details of fit would help me separate the peculiarities of my own body from those of other riders. 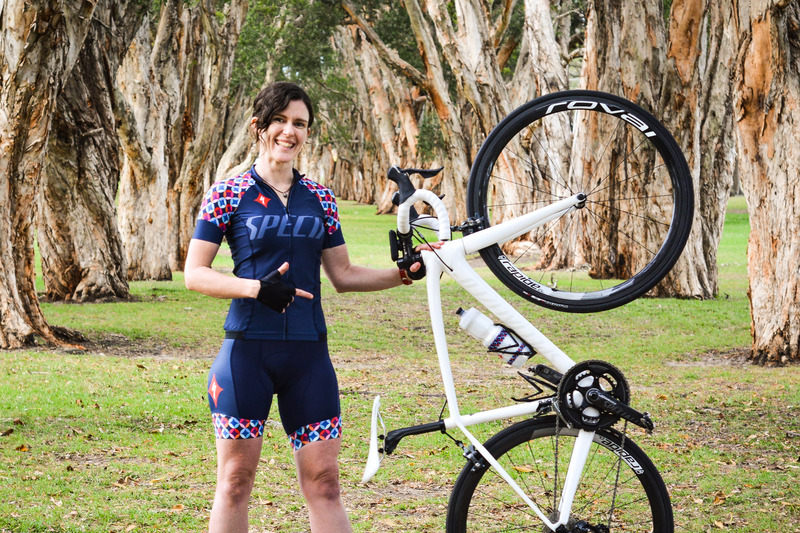 One of the critiques of women’s-specific bikes at the top end is that brands offering unisex designs allow pros to choose from different bikes for different occasions: hill climbs, time trials, flat stages. By comparison, a smaller market and demand for high-performance bikes for women means the ones you see in the pro peloton are designed to do it all. At a consumer level, this is more of a freedom than a constraint: a bike for just about every situation, allowing the increased enjoyment that comes with versatility and choice. Due to the price, a lot of women who buy one of these bikes tend to keep them for a while. Having ridden one for the best part of a year now, I can understand why. The design and build has comfort, dependability and performance taken care of. The component choices are practical and durable and don’t need any serious upgrades to keep the bike, and the rider, performing at their peak. All that’s left to do is pedal hard, feel your body float over the terrain and focus on the road ahead. This is exactly how a good bike should feel and why I’m so glad that there are an ever expanding number of options out there to suit different types of riders, body shapes and dispositions. If it’s the thrill of the chase that you like, the Amira is a bike that is hard to surpass. You’ll see this kit on Specialized staff and local ambassador riders. In this case, it’s a sign of mutual respect for work growing women’s cycling globally. Humbled. Proud. Images: David Rome (riding the bike), Gaye Camm (standing next to it), Kath Bicknell (stills). For info on full specs and geometry: Details are on the Specialized website. Further reading: This link will take you to an interview with Specialized’s Global PR Manager, Katie Sue Gruener, on the research, development and marketing processes behind this bike, and things to consider when deciding between a racier feeling bike like this one, the Ruby, which has more of an endurance build, or the Alias, which is better suited to triathlon.